VANCOUVER - B.C. community newspaper tycoon David Black proposed today building a $13-billion oil refinery near Kitimat to use all of the crude from Enbridge's controversial Northern Gateway pipeline. It would mean tankers would ship refined fuels like gasoline off of B.C. 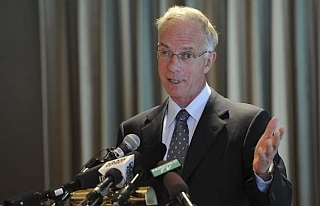 northwest coast, not heavy oil from Alberta, reducing environmental risks, says Black. A refinery also promises 10 times as many jobs as an export pipeline. Black is hoping his proposal will change opposition from British Columbians and first nations, many of which have rejected the $6-billion project because they say the economic rewards for B.C. are not great enough to offset the risk and consequence of an oil spill on the pipeline or off the northwest coast of British Columbia. Last month, B.C. Premier Christy Clark also declared the province would not even consider the Northern Gateway project unless it gets a much greater share of the economic benefits. Acknowledging that oil producers that want to ship oil on the Northern Gateway pipeline are not in favour of a refinery in B.C., Black said his new company, Kitimat Clean Ltd., is submitting an environmental assessment application to build the refinery. Since the economic returns from a refinery are less than exporting oil, and no company has stepped forward to spearhead the project, he decided to do it himself, said Black. He first proposed the idea to Canada's oil companies seven years ago when he was chairman of the B.C. Progress Board, and resurrected the idea 11 months ago. "I am hoping to serve as a catalyst to attract an industry consortium that will undertake the project. But if no industry player steps forward during the two-year environmental assessment I will do all that I can to organize the capital and build the refinery," said Black, who owns 150 community newspapers in B.C. and the United States. Added Black: "I think the pipeline and the refinery are crucially important to our northern communities, to B.C., to Alberta and to Canada. We must protect the environment, but we must create jobs for the next generation as well. It is our responsibility to do both." The proposed refinery in Kitimat would provide many more jobs than an export pipeline. The refinery is estimated to create 3,000 jobs, half of those directly in the refinery and the other half in contract jobs. Another 6,000 workers would be hired during the five-year construction period. Black is proposing to reduce capital costs from Canada's high labour rates by building refinery modules offshore to be shipped to Kitimat. The Northern Gateway pipeline is estimated to create about 350 permanent and contract jobs in B.C., one-tenth of the permanent jobs a refinery would create. A pipeline would also create thousands of jobs during its three-year construction phase. The planned Northern Gateway pipeline is meant to open up new markets for crude from the Alberta oilsands, breaking the reliance on the U.S. market, and as a result bringing a higher price for Canada's oil, an estimated $25 billion more a year. That goal can be achieved with a refinery on the coast with access to Pacific Rim markets, said Black. The refinery will also remove any threat of "catastrophic" offshore pollution from heavy crude oil because refined fuels such as diesel, gasoline and kerosene evaporate, said Black. There would also be about 30 per cent less tanker loads into Kitimat because the diluent used to thin the crude oil shipped to Kitimat would be stripped out during refining and sent back to Alberta via pipeline. Black also argues that building the refinery in B.C. will ensure it is a state-of-the-art facility with a lower environmental footprint than in other areas. While it will produce about seven million tonnes of carbon dioxide emissions, those emissions would have been produced anyway, he said. Black has briefed the B.C. premier, Clark, but he said the province hasn't told him what their position on his proposal is yet. He added there are many legitimate concerns from first nations along the pipeline. "In my view we should not proceed with the pipeline or refinery unless there is confidence that any pipeline leakage will be immaterial," said Black.